Every Thursday Deb from Booking Through Thursday asks a question which participants respond on their own blogs on Thursdays (or any day they can, thankfully for me). They then share their links at the main site and visit other participants blogs. I still remember going to my first midnight release party. It was for the final Harry Potter book. I was not one of those who started reading as soon as I hit the store parking lot, but I did go home that night, went straight to bed and spent the entire next day reading the book, start to finish. Then there was the time I was at the bookstore when it opened on a Tuesday, the day one of Janet Evanovich's Stephanie Plum series' books was being released (back when I read the series). I had taken the day off work in anticipation of buying and reading the book. I was sorely disappointed to find out the bookstore hadn't yet put the books out. I had to ask someone for it and was told to come back later in the day. I guess the books were still in a box in the back. I was not a happy camper, to say the least. I haven't gone book crazy like that in years. At least not more than a squeal and maybe a little feet stomping in glee. I rarely buy or seek out books immediately upon their release anymore. An already overflowing TBR collection, my war on clutter (I didn't say I was winning . . .), and my tighter budget make me much less likely to buy a new release, at least not right away. I like to wait for a good deal generally, but sometimes I cave and buy it if I just can't wait any longer. Usually with the next book in a trilogy, especially if it's a final book. I do not buy books at the rate I once did. I think I am most guilty of buying earlier books in a series when I get a series book to review from a publisher or decide to buy an e-copy of a book I have in print because it is more convenient to read the book on an e-reader. And those Kindle or Nook daily deal can sometimes be irresistible . . . The closest I probably come though is with Jim Buthcer's Dresden Files series and Sue Grafton's Kinsey Millhone books. They are about the only two author's whose books I must buy in hardback these days. And even then I am so behind on both series that I do not run out to get them right away. What new releases can't you wait to get your hands on? Someone at work yesterday asked which I would be willing to give up forever if I had to choose: chocolate or cheese. My immediate thought was chocolate, but then I started thinking of all the foods I eat that include cheese as a main ingredient. My final answer has to be cheese. Sorry, my beloved chocolate. I thought of that as I read today's question. I live in a relatively mild climate (although summers can be torture without an air conditioner). No snow, which means no hibernating in the winter on designated snow days. Rainy days are few and far between, but still much loved. I love the idea of spending a rainy day reading all day. It rarely happens (either no rain or I'm working), mind you, but it's a wonderful idea in theory. In contrast, I often imagine myself stretched out on a blanket in the park reading on a beautiful sunny day, a nice breeze to keep the heat bearable. It has been ages since I last did that. My daughter is not yet of an age where I am comfortable taking my eyes off her for long as she plays--whether near me or from a reasonable distance. More often than not, I do my reading indoors, usually at night before bed or at the office during my lunch break. I read on the weekends when my daughter's favorite show is on if I have nothing more pressing to do, or sometimes when my husband and daughter are keeping each other entertained and I can slip away unnoticed. Ultimately, the weather rarely plays a factor in how much reading I do. Both sound like perfect reading weather options to me--if only the stars would align to make that possible. What about you? Do you prefer rainy day reading or being able to read outdoors? 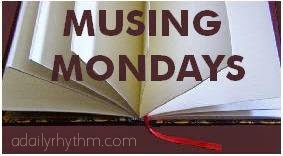 Musing Mondays, hosted by Jenn from A Daily Rhythm, asks participants a random question every week, asking that they then post their links and visit the other participants to see what they have to say. How often do you use your local library? Are you happy with their availability? I love my local library. It is on the small side, but it has a marvelous children's selection, rows and rows of children's books. There is a nice size area for children and their parents to sit and read. Just about every Saturday, we visit the library, taking advantage of the reading selection and, as of late, the air conditioning. After a couple hours of soccer and playing at the park, it is nice to rest awhile in a cool place. It has also proven to be good shelter when the rain starts falling. My daughter enjoys selecting her own books to read, pulling them off the shelves and bringing them to either my husband or me, whoever she wants to read to her at that moment. I will sometimes select a few for her to read as well. We don't always check out the books, although occasionally we do. The adult selection is made up mostly of popular fiction and it's not a huge selection at that. I am not sure I would always be able to find what I am looking for if I wanted something specific. The city (and county, for that matter) has quite a few library branches, however, and I imagine the inter-library loan program might help with that. As it is, I rarely use the library for my own purposes. I feel guilty at the mere idea of checking out books I have to return by a deadline when I have my own unread books sitting at home to read. There is another part of me that worries if my not using the library for myself is something my daughter notices and will be influenced by. I keep telling myself I will start using the library more--especially for books on my wish list (rather than buying them)--but it hasn't happened yet. Do you frequent your local library? What do you think of the selection there? I enjoyed reading your answers, Wendy! Melody - When I think back to all the books I used to buy . . . It was too many, especially since I ended up giving away so many I never read when we moved and then again last spring. I try to be much more careful now. Yes, I understand exactly what you mean about finding peace to read. It is hard with little ones around. The chocolate or cheese question is tough! Like you my first thought is I can't live without chocolate but than could I really survive without cheeseburgers? I'm glad I don't really have to decide! I think if I could pick I would spend a rainy day doing nothing but reading however as you know having small children makes that difficult! I do the same thing with our library. We go once a week for the Tornado but I very rarely check books out for myself because I'm so aware of the sheer number of review books waiting on me at home! I took Mouse for her free birthday cookie at B&N today after her doctor's visit, and she demanded I buy her a book. A toy, I can refuse, but not a book. Nyze - I understand the crazy schedule. It can be hard to find time to read, but I always try to make time for it too. Love the "give up" question. I would choose cheese too. Can't give up chocolate. 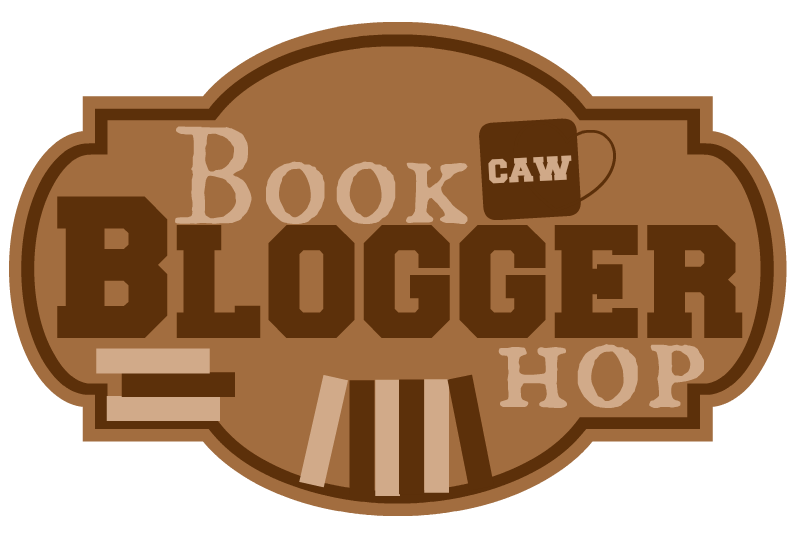 Nice Blog Hop Answer. It is always chilly in Pittsburgh. The summers have not even been warm the past few years. Reading and rain go together for me, but so do sunny days on the back porch if I don't have the urge to clean. Yes...I love to clean when the sun is out. Elizabeth - Reading and rain do sound like perfect mates. I wish it rained more where I live, but I imagine my daughter wouldn't like that much. She loves to play outside. Iliana - Yes, that's how I would feel if I used the library more. It would be hard to give up chocolate or cheese. I never realized how much cheese I ate until I started really thinking about it. Jenclair - That's good. I really need to step up my use of the library. It'd probably be easier if I read faster.